This abbey was first documented in 972, when it belonged to the Bourbon del Monte family. It passed to the city of Città di Castello before 1403. The abbey itself has been transformed by subsequent development, but part of its church, which is dedicate as Santa Maria e Sant’ Egidio, survives. The current facade of the church was built in the 14th century, when two thirds of the nave were demolished. The newly-discovered arcade on the left of what is now a courtyard in front of it belonged to the original construction. The crypt under the apse is currently closed for restoration, following damage suffered in the earthquake of 1997. This institute belongs to the Piccole Ancelle del Sacro Cuore, an order of nuns that was established in 1916 by the Blessed Charles Liviero. It is housed in what was Palazzo Tini: the Blessed Charles Liviero acquired the palace in 1920 and had it restored and adapted for use as the Pensionata Sacro Cuore, a school for poor children that the nuns then operated until the Second World War. 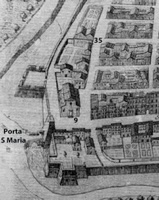 The complex now occupies the entire “island bounded by Via XI Settembre, Via San Girolamo and Via Trastevere. 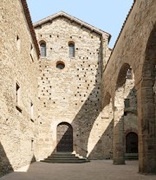 The complex now acts as the nuns’ headquarters in Città di Castello and includes the their church of Santa Lucia (open to the public only on the feast of St Lucy, 13th December) and an old people’s home. The nuns also run a primary school in nearby Pomerio San Girolamo. This church, which probably dates to the 14th century, belonged to the Compagnia di Sant’ Antonio Abate. In 1609, the confraternity agreed to cede the church and adjacent buildings to the Jesuits, while retaining certain rights over them. The city authorities had begun negotiations for the establishment of a Jesuit church and college in Città di Castello in 1572, initially without success. 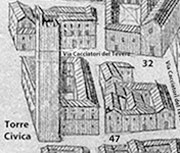 In the period of 1609-61, they enlarged the church church and moved its entrance to to a newly-established piazza (now Piazza Gioberti). However, there were then problems with finance, and the Jesuits withdrew from the city. After their return in 1682, the Jesuits bought adjoining properties from Chiappino Vitelli and used the site for their college. Further enlargement of the church was carried out in 1699. When the Jesuits were suppressed in 1773, the complex passed to the nuns of Santa Margherita. They remained here until ca. 1790, at which point they moved to the Monastero di SS Benedetto ed Egidio. Pope Pius VII re-instituted the Jesuits in 1814, and negotiations for their return to Città di Castello began in 1823. There was considerable political opposition, but they finally returned in 1844. They negotiated with Luigi Bufalini on a 99 year lease on Palazzo Bufalini in order to build a new college, and secured the approval of Pope Pius IX for the project. The college opened in 1846 but the political situation deteriorated and the Jesuits were driven from the city in 1848. The church, which had a number of subsequent uses, was opened as an auditorium in 2006. The ex-college now belongs to the Monte dei Paschi di Siena. These statutes of the Compagnia di Sant’ Antonio Abate in the Museo del Duomo presumably came from the confraternity’s premises here. ✴the death of St Antony Abbot and the ascent of his soul, carried by angels. This polychrome wooded statue from Sant’ Antonio Abate is now in San Francesco. 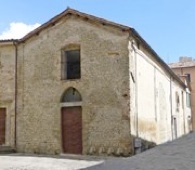 The Università dei Ferrari (blacksmiths’ guild) moved to this church from San Fortunato in 1500, after Lucia Vitelli had persuaded the cathedral chapter to release it for their use. (The palace visible on the right in this photograph belonged to the Vitelli family). The church was suppressed in 1827. This ex-oratory  was built for the Confraternita di Santa Barbara. It stands against the city wall, on the site of an ancient church of this name that had been demolished to facilitate the fortification of the city during the First War of Castro (1639). These frescoes by Mattia Batini are in the vaults of the oratory. 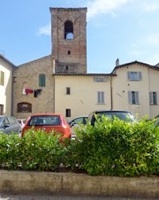 It is now a pasta shop (illustrated on the left), and is only recognisable as an ex-church because its campanile can still be seen from the space behind it. The Vitelli family apparently built this campanile, which was once decorated with the family arms. This triptych from San Bartolomeo, which is attributed to Antonio Alberti da Ferrara, was moved to the Vitelli Chapel in San Francesco in 1921 and to the Pinacoteca Comunale in 1931. 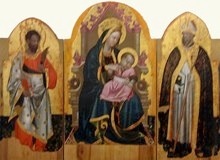 It depicts the Madonna and Child enthroned in the central panel, flanked by SS Bartholomew and Benedict. This panel in San Francesco, which is attributed to Giovanni Battista Pacetti, lo Sguazzino, came from San Bartolomeo. This church in Via del Popolo (which was previously known as Santa Maria del Popolo) belongs to the Confraternita del Buon Consiglio della Buona Morte e Misericordia. It incorporates as its sacristy the ancient Cappella della SS Annunziata, a chapel used by those condemned to death. 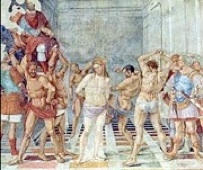 A fresco [date ??] 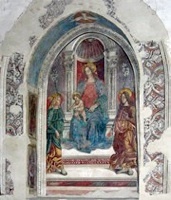 on the wall of the earlier church, which depicted the Madonna and Child with SS Antony Abbot and Catherine of Alexandria and was known as the Madonna del Buon Consiglio, was deemed to have performed a miracle in the late 16th century. The church was duly rebuilt to house it with greater honour. Bishop Ludovico Bentivoglio laid the foundation stone in 1588 and the detached fresco was installed on its high altar in 1594. [Is it still behind the shutters above the altar ??]. Bishop Giovanni Battista Lattanzi restored the church in 1757, at which point it took on its present appearance. The church is now used by a lay confraternity known as the Templari di San Bernardo. This panel above the door to the sacristy (to the right of the high altar) is by/attributed to Giovanni Battista Pacetti, lo Sguazzino. It depicts St Crescentian on horseback, killing a dragon. The Oratorio di Santa Caterina  belonged to the penitent Confraternita di Santa Caterina, which was documented outside Città di Castello [at Ponte di Nuvole] in 1256. The Dominicans gave the brothers what had been the church of San Pietro di Massa in 1367, on condition that they carried out necessary repairs to it. 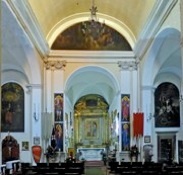 The church then became known as the Oratorio di Santa Caterina. 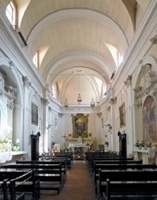 The Dominicans, who had moved to a new church of Santa Maria della Carita  by that time, subsequently moved to the larger church, San Domenico . As their convent took shape, the oratory was surrounded by its orchard. It was demolished in 1942 to make way for an extension to the tobacco factory. There is an old photograph of the facade of the oratory in this page of a website by Alvaro Tacchini that describes the establishment of the the tobacco factory. ✴the other side depicts the Virgin and St Catherine interceding with Christ for the people of Città di Castello and, in particular, for members of the confraternity (identified by their white robes). This panel, which came from Santa Caterina, is attributed to Pietro Montanini. It is now in the crossing of the Duomo. The original oratory here, which was documented in 1126, provides evidence for the early cult of St Crescentian. It belonged to the Confraternita di San Crescentino, which was first documented in 1264. Traces of it survive in the sacristy of the present church, which was built in 1420 and extended in 1507. The frescoes in the sacristy include this one, which depicts St Crescentian on horseback, killing a dragon. 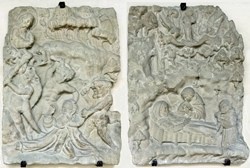 •on the right, the Crucifixion (illustrated above), of which only the lower part survives. 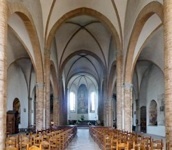 This church, which belonged to the Confraternita di Santa Croce, was documented from 1339. It was closed after the earthquake of 1789. This gilded wooden cross from Santa Croce is now in the Museo del Duomo. This ancient church, which gives its name to one of the four rione of Città di Castello originally belonged to the Eremo di Fonte Avellana. In 1270, Bishop Nicolò excommunicated Tommasino, the Prior of Sant’ Egidio because he had buried a usurer named Donadeo. The church passed to the Somaschi Fathers in the early 17th century and then to the Duomo in 1837. It was deconsecrated after the First World War. The Blessed Charles Liviero established a cinema for children here in 1931. The building was abandoned in the 1980s and remains closed, despite a restoration that was carried out in 2010. A church on this site dedicated as San Pietro della Scatorbia was documented in 1232. 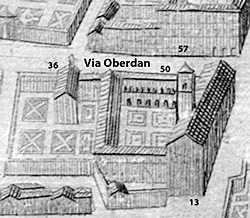 The site passed to the Oratorian Fathers in 1622. In 1633, Pope Urban VIII gave permission for the translation of the relics of SS Albert and Brictius to be translated to the church from the church of San Pietro di Boneporte, near Villa di Grumale, outside Città di Castello. This provided funds for a new church, which was designed by Nicolò Barbioni. They also commissioned the adjacent Oratorio degli Angeli (1687). The community was suppressed in 1860 and the complex housed the Pinacoteca Comunale in 1876-1912. Part of the ex-convent in Via Borgo Inferiore now houses a primary school. This panel from San Filippo Neri is attributed to Francesco Mancini. It depicts St Peter fleeing from martyrdom in Rome: he has a vision of the Risen Christ, who asks him “Quo vadis” (where are you going), and is shamed into returning to embrace his fate. The panel now in the Pinacoteca Comunale. This church belonged to the Confraternita di San Giovanni Decollato, which was documented in 1367, and which Pope Urban VIII associated with the Compagnia di San Giovanni Decollato, Rome in 1642. This confraternity assisted those condemned to death. 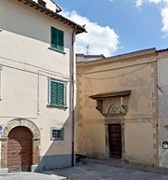 The church has its main entrance in Via San Girolamo and its side entrance in Via Sant’ Andrea. Its campanile can be seen to the right of this side entrance (photographed to the right here here from Via della Fraternita). The building to the left of the facade now houses the Oratorio San Giovanni Bosco. The aedicule below the campanile has an interesting relief at its apex. The star of David below it suggests that this building might once have been used as a synagogue. ✴the Baptism of Christ with St John the Evangelist [and ??? ], with God the Father in glory above (16th century). ✴The other face depicts the Baptism of Christ. The work is generally though to be from the workshop of Luca Signorelli. Following its restoration in 2011, Tom Henry (2012, referenced in the page on the artist) judged that the first side was indeed probably a workshop production, but that the second side was probably largely the work of Signorelli himself. The earlier church (13th century) on the site had been the parish church of the Vitelli family, whose home was in nearby Via della Mattonata. Shortly after his recapture of Città di Castello, Nicolò Vitelli commissioned the present church from Elia di Bartolomeo Lombardo. It was built using material recovered after the demolition of the nearby papal fortress. The church was restored in the 20th century. Beatrice Vitelli commissioned these choir stalls for the Monastero di Ognisanti (of which she was the abbess). They are dated by inscription and carry the Vitelli arms. They were documented in the church on a number of occasions in the period 1728-1878 and subsequently became part of the civic collection. They were moved here in the 1950s and adapted to fit the polygonal presbytery. This ex-church is now incorporated into the garden of Palazzo Vitelli a Porta Sant' Egidio. 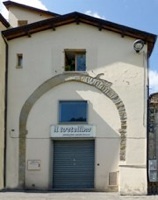 It originally belonged to the Arte della Lana (woolworkers’ guild). It was also known as Santa Maria dell’ Arco because it stood above an arch over the canalised river Scatorbia. It passed to the Vitelli family in the 16th century. and remained in use for cult purposes until 1860. An ancient church here, which was documented in 1197, was rebuilt after the earthquake of 1789. 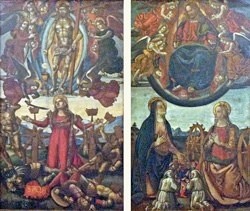 This fresco, which forms the altarpiece of the altar on the right, is attributed to Avanzino Nucci. Angels collect the blood of the crucified Christ, the Virgin and St John the Evangelist stand to the sides, and St Mary Magdalene kneels at the foot of the cross. This altarpiece on the left wall, which is attributed to Giovanni Battista Pacetti, lo Sguazzino, depicts the Madonna and Child enthroned with saints and angels. 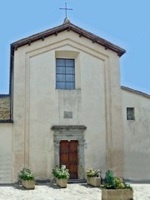 Giulio Vitelli gave this ancient church to the Servite friar Sebastiano Sellari in 1527. It was rebuilt after the earthquake of 1789. It still operates as a parish church. This panel on the high altar, which is attributed to Raffaellino del Colle, depicts the Madonna and Child with SS Sebastian and Michael. 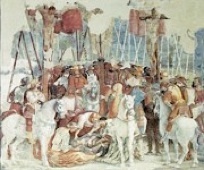 The panel probably dates to the period shortly before the death of Giulio Vitelli in 1530. This lovely painted processional cross from San Michele Arcangelo is now in the Museo del Duomo. This church, which is now deconsecrated, belonged to the Congregazione degli Artisti. This church originally belonged to the Confraternita della Santo Spirito, which operated a hospice here on behalf of the canons of the Duomo. It is documented as the beneficiary of a will in 1363. 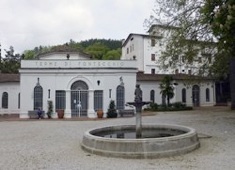 The hospital function was absorbed by the Ospedale di San Florido in 1513. The confraternity, which continued to use the church here, adopted the cult of the Madonna del Carmine in 1609 and was aggregated with the Fraternita di Santa Maria del Suffragio in Rome in 1628. The church probably took on its present appearance at about this time. 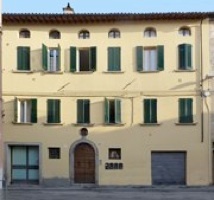 It is now the headquarters of the Confraternita di Gesù Legato alla Colonna and the Pia Associazione Madonna del Carmelo. According to tradition, Santa Stefano was the first duomo of Città di Castello, which was destroyed by Totila in the 6th century. 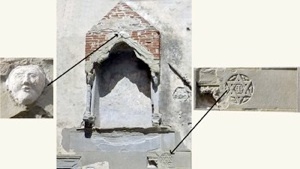 Traces of it were discovered in 2003-6 during the restoration of Palazzo Vescovile and can be seen in the Sala di Santo Stefano inside the palace. 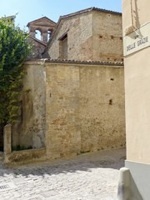 This church  was rebuilt behind Palazzo Vescovile and dedicated as Sant’ Illuminato after the presumed relics of this saint were brought here from nearby Castello di Monte Albano in 1230. 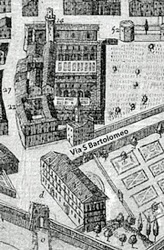 The new church, which belonged to the Università dei Sartori (tailors’ guild), was subsequently demolished. The Accademia degli Illuminati the local architect Antonio Gabrielli to design and build this theatre, which was inaugurated in 1666. Marchese Sebastiano Brozzi extended and restored it in 1720. A second restoration began in 1783 under the architect Giacomo Mancini. This work, which was interrupted by the earthquake of 1789, was finally completed in 1796. The decoration in 1829 was the work of two local artists: Vincenzo Chialli (a painter) and Giuseppe Crosti (a sculptor). It was remodelled again in 1861 by Scipione Lapi, who refaced the external facade, extended the atrium and constructed the loggia. The theatre was closed after the First World War, but restored and reopened in in 1920. It passed to the Commune in 1939. The theatre, which can hold an audience of some 400 people, is still in use. The earlier baths on this site by the Scatorbia, some 3 km upstream from Città di Castello, were destroyed by an earthquake in 1789. The Commune commissioned Guglielmo Calderini to design the current Terme di Fontecchio, which was restored and remodelled in 1949. Excavations here in 1868 unearthed evidence of a Roman spa that might have been the one enjoyed by Pliny the Younger and his wife, Calpurnia. A Roman inscription (CIL XI 5942) that was also apparently found here alludes to the fact that a man whose name can no longer be deciphered had left a considerable amount of money and a building for housing the baths for “the commonwealth of Tifernum Tiberinum”. The inscription, which is now in Palazzo Comunale, actually records a legal ruling reducing the bequest in favour of other potential beneficiaries. Return to Monuments of Città di Castello.